Sometimes you don't create a new life for yourself because you want to but because you have to. Second chances aren't always welcome as much as they are necessary. 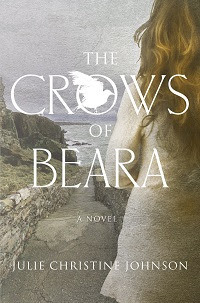 Julie Christine Johnson's novel, The Crows of Beara, pairs necessary second chances with an environment versus economy plot to create a gentle tale of love, making the right choices, and acceptance. Annie is a recovering alcoholic. Her marriage is crumbling thanks to her own destructive actions and her job in PR hangs by a thread. She's not certain she even wants to keep any semblance of her old life but she is afraid to let it all go, so she lobbies for a job in Ireland, a place she has visited and loved before. Her job will be to convince the small community on the Beara Peninsula to accept copper mining in their area, both on and off shore. The mines will provide jobs to an area that is struggling economically and help keep the young people in the community instead of leaving for jobs as they do now. It should be a fairly easy sell but Annie hasn't been told how badly the company has already bungled public relations, that there's a grass roots campaign in the town to oppose the mines, or that the mines will most probably destroy one of the Red-Billed Chough's last remaining protected Irish habitats, nor has she counted on meeting James, the head of the Irish subsidiary, a man who makes her uncomfortable and who seems strangely secretive given that he's hired her for a PR job where she needs to be knowledgeable about all aspects of the issue. But Annie needs this job and she can't afford to bungle it. When Annie arrives in Ireland, she is immediately comforted by the place, as she'd hoped and she starts to meet people in the area the mines will affect. Daniel is a local guide and a copper artist whose sister is helping organize the resistance to the mines. He is as damaged a person as Annie is but the two of them feel an immediate pull to one another. Meeting Daniel and his sister Fiana, Annie comes to understand that she might be on the wrong side of the environment versus economics fight. As she faces the demon of "The Addict" in her, she must also decide what she wants going forward and what the right decision is morally, not only for herself but for the beautiful and unspoiled but economically struggling area. While the major external conflict of the novel is that of the copper mines potentially destroying the landscape and the chough's habitat, the internal conflict and love story between Annie and Daniel, with all of their attendant baggage really dominates the story. 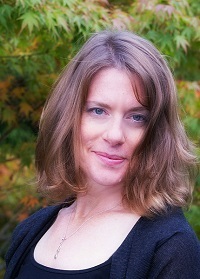 There's no doubt in the reader's eyes which side of the environmental/economic debate that Annie should be on, despite her attempt at acknowledging there are two sides with reasonable arguments, and the characterizations of those on the wrong side of the debate are drawn in ways that make it clear that they are not working for the forces of good. The story is lyrically told and the scenery as described is breathtaking. There's a mystical element (this is about Ireland after all) in the weaving in of the legend of the Hag of Beara and the inclusion of the Mise Eire poem about Irish nationalism. The feel of the book is very romantic even as it addresses darker issues of alcoholism, guilt, the environment, and self-discovery. There's a coincidence that is a little unlikely and Annie's unburdening to Fiana that remains a mystery to Daniel should probably have come out between Annie and Daniel, not Annie and Fiana. But over all, the writing is engaging and the story flows well. Johnson's love for Ireland shines in this complicated love story, a love for a place and it's creatures and between characters who are each being given a second chance if they can just accept it. For more information about Julie Christine Johnson and the book, check out her website, like her on Facebook, or follow her on Twitter, Instagram, or Pinterest. Check out the book's Goodreads page, follow the rest of the blog tour, or look at the amazon reviews for others' thoughts and opinions on the book. Kristen, thank you for the beautiful review. Happy reading! Ireland is one of those places you really can't help but fall in love with - I've been there twice and long to go back.